Pakistan veteran Mohammad Hafeez has been ruled out of the upcoming three-match ODI series against West Indies with the 35-year-old failing to recover from the calf injury that had forced him to fly home during Pakistan’s recent tour of England. 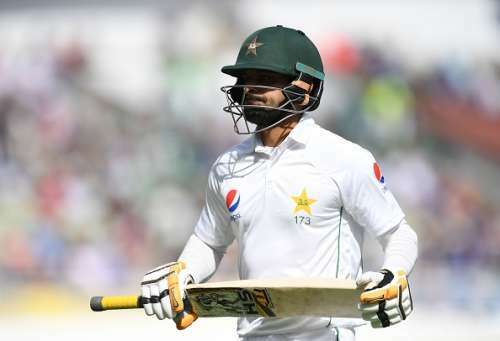 Hafeez, who has been advised a further rest of at least three weeks, is facing a race against time in order to be fit for the Test leg of the tour which begins with the first match to be played at the Sharjah Cricket Stadium from October 13. “He (Hafeez) is undergoing a rehab program at the national cricket academy but needs a further three weeks to make a complete recovery,” Dr. Muhammad Riaz, a member of the Pakistan Cricket Board’s (PCB) medical panel, said. Hafeez has been struggling with the bat for quite some time now and his dismal performances during the tour to England invited heavy criticism with Pakistan head coach Mickey Arthur not holding back in his remarks stating that he would not shy away from dropping underperforming cricketers from the squad regardless of their past reputation. He stuck to his word dropping Hafeez for the fourth and final Test that the visitors won, thus levelling the four-match series 2-2 and failed to impress in the first ODI as well before injury forced him to return home. His utility to the squad has also been a spot of bother for Pakistan with Hafeez seemingly reluctant to undergo a bowling test to modify his bowling action that saw him being banned from bowling in international cricket for a period of one year. Though the tenure of the ban has already ended, Hafeez has not taken any step in the direction of getting his action corrected and with no improvements in his batting form, the Pakistan selection committee headed by Inzamam-ul-Haq could well have overlooked Hafeez for the upcoming series even if he was fully fit. Opener Sami Aslam is another player who will miss out on the ODI series with reports indicating that the 20-year-old, who scored only 33 runs in the three matches he played against England, likely to face the axe. Those expected to earn a recall to the 50-over side include the middle-order pair of Umar Akmal and Asad Shafiq who impressed during the recently-concluded National T20 Cup. The final ODI squad is expected to be named within the next two days with the tour kicking off with the first T20 to be played on Friday.